Tempered Dreadwind Rapier What's this? This one of the finest rapiers that Strongblade sells at this price range. It has a breathtaking, oversized swept hilt, chromed in nickel and swirling like a sandstorm around the hand that wields it. The weight and balance is phenomenal and the construction is flawless. It's a work of art and would add a punch-in-the-stomach pizzazz to any costume or wall. 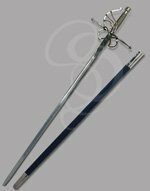 The blade is high-carbon steel, which would make the sword perfect for sparring if it weren't for the nickel-plated guard. You probably wouldn't want to use this beauty for sparring anyway: Would you fence with Michelangelo's David? A wire-braided grip and a mirrored pommel finish off the hilt. The sheath is leather-wrapped wood with steel accents. The sword is full-tanged and hand-crafted. Go ahead and buy it. You owe it to yourself. 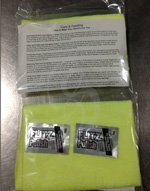 The shipping was fast and the product came in great condition. Will definitely use the website again. These swards are always the perfect present for our church members who have gone beyond to help our community! The fact that we could customize them with our logo and symbols makes it that much more special. Perfect for my fantasy book cover! I needed a rapier for my upcoming cover photo shoot. 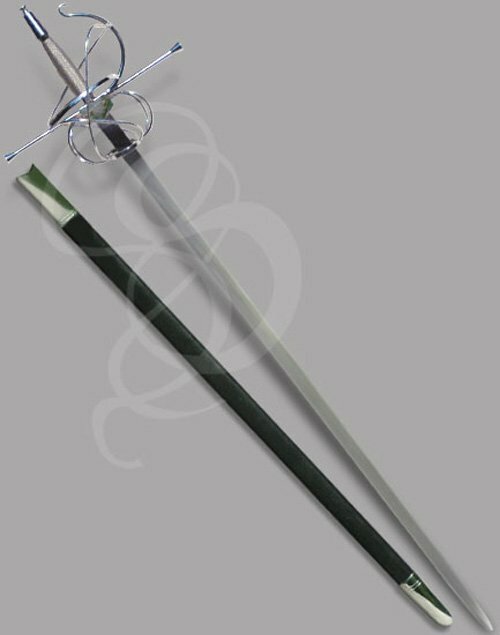 The swept hilt rapier was the perfect weapon for my model and book trilogy. I also added the Liege Blade Noble Dagger for the off hand weapon in the photos. Together they made a perfect and lethal-looking combination. The quality of the tempered blades was excellent and I will definitely consider Strongblade for future projects and weapons. You can check out the covers of the first two books in the Accidental Champion trilogy to see the blades "in action" where ever you buy ebooks online. This is an amazing piece of art. The hilt is indescribable, to say the least. I normally prefer big, brute longswords, but when I saw this blade, I had to add it to my collection. Craftsmanship is amazing, quality is unmatched. I would highly recommend this sword. I can guarantee it will not disappoint. My wife bought me this as a gift. I wanted a real sword, not just something to hang on the wall to impress people. This sword is awesome. It is beautiful and more than I expected. It is the jewel of my collection. Whoever made this weapon took time to make an sword that is like a piece of art. Yet, it is sound, beautiful and without flaws! I am most impressed with this and everyone who has held it has also been highly impressed. We give this sword in appreciation to members of our church who have dedicated time and have shown support towards humanitarian efforts. It is always well received, especially when it includes the insignia and logo and is beautifully personalized. We give these swords as part of an acknowledgement for donations to our building renovation project. Strongblade engraves them and even has taken our custom images and includes that as part of the personalization. The swords are always received with great enthusiasm and are quite beautiful! We award this sword to those who have helped on a project for our church! It is always so well received! Strongblade always does a wonderful job!